Predator 8x22 is rated 4.3 out of 5 by 8. Rated 5 out of 5 by Flykaster2 from Better than expected These binoculars on clearance from Sierra suprised me. 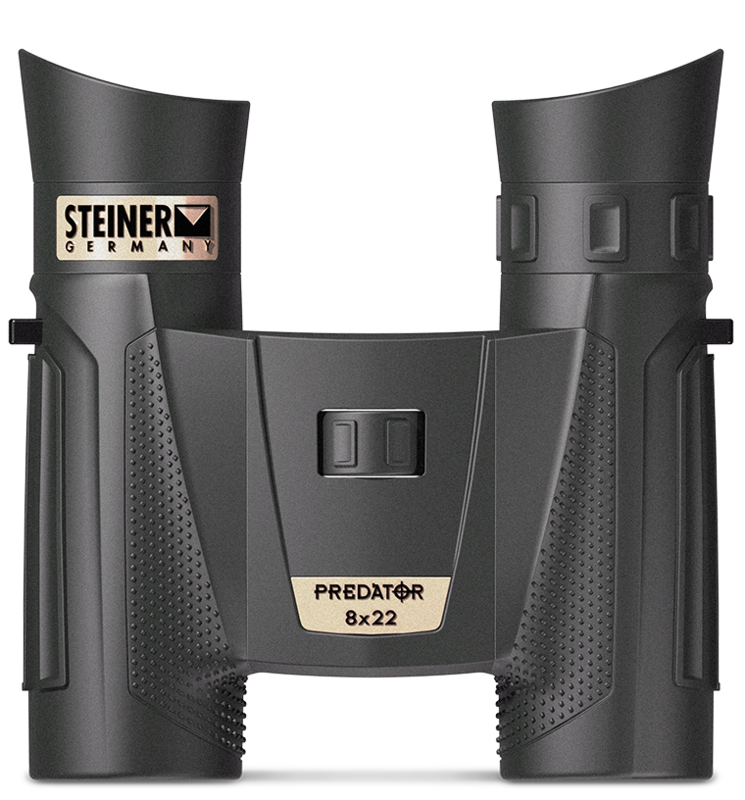 I own another higher end Steiner binocular model and expected quality but had no idea a compact model (under $90) could be so good. Buy them. Rated 1 out of 5 by sousyp33 from Disappointing I currently own two pair of Steiners. Merlin 10x32 and Wildlife 8.5x26. Love my Merlins they perform very well! But thats a different story on the Wildlife. While I love the starp that came with Wildlife the performance is terrible. Never can get both lenses to focus the same. When you think that they are close it wont hold its setting. So I decide to go out and by another small pair. I settle on the Predator 8x22. Just got them in today from the dealer. First I noticed the lenses were dirty. Second the protective eye cups were to big. Didnt get any lenses protectors for the bottom lenses. Third the strap included just isnt worth the amount of money paid. Fourth the Predators didnt have any shrink wrap around the package. Which leads me to believe how many people handle them. Seroiusly thinking on sending them back where i bought them. Rated 5 out of 5 by scottgil from Awesome, so light so small yet so clear These are a great buy. Steiner does it very well. They easily fit in the pocket of my cargo shorts which is nice when I go on walks. These are in my vehicle everyday of the week. Rated 5 out of 5 by Toddstang from Best compact binoculars! I cannot believe the quality of these binoculars. The clarity is better than any other compacts I own. Really nice! Rated 5 out of 5 by archer1946 from Light, bright, and good contrast. I bought these to use for bowhunting. Their light weight, compact size, and ease of focusing are outstanding. What is the difference between the predator and the predator pro? I have an older model Predator 8X22, &nbsp; see # &nbsp;01 208729. &nbsp;I need to replace the eye guards. &nbsp;Can you give me advice? I own two pair of Steiner binoculars, and both are not usable. My best binos, Predator 8x30, are prior to the poor prism design; left eye piece popped out while hunting. The other is Safari model 8x22, can't get focused.What is your return policy? How do you attach the covers on to the lanyard? The dial only adjust one side of my binoculars. &nbsp;How do I get the dial to adjust the other side?